This is one of two formats for our After the Boxes Are Unpacked study. The second format is our popular and completely revamped Video Series. 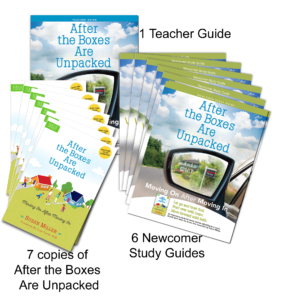 Both formats are based on the book, After The Boxes Are Unpacked by Susan Miller. Susan is founder and president of Just Moved Ministry. Our Study Start-Up Kit will equip you with everything you need to organize and lead an After the Boxes Are Unpacked study for 6 women and a leader. Included is our resourceful Teacher Guide with its step-by-step format that easily and confidently guides the group leader from start to finish. Online Teaching Resources: reproducible handouts suggested for each session, teaching and publicity ideas, and publicity materials that include a reproducible poster, brochure, and half-page flyer. NOTE: Most groups recoup their investment in the materials by charging a nominal class registration fee. Thank you again! Just Moved Ministry invites you to be a part of our fast growing outreach family. You will make a difference - one newcomer at a time!